A dense, spirited, deeply thoughtful prequel to English poet and editor Schmidt’s Lives of the Poets (1999). Assuming that his audience is as devoted as he is to the importance of classical texts, the author argues that readers should not be “impoverished by a pragmatic sense of historical fact” and miss out on the fun of reconstructing the dauntingly inaccessible lives of the poets who created them. In his magisterial introduction, Schmidt sets out the physical evidence discovered over the millennia in papyri, tablets, amphora, and the like, then elucidates the function of scribes and libraries. “For the ancients, poetry socialized people,” he writes, emphasizing the oral tradition that dominated in Homer’s heroic age. By the fifth century b.c., the act of writing down poems already invited distortion and embellishment. 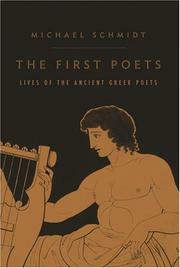 In 15 chapters, Schmidt sifts through the available evidence—often elusive, sibylline, and apocryphal—and conflicting scholarship to give shape to the lives of poets as celebrated as Pindar (favored by English poets) and Apollonius (“who understands, honours and even privileges the female perspective”), as well as the more obscure Mimnermus of Colophon (“an elegist of pleasure”) and Hipponax of Ephesus (“a notable sourpuss”). The author treats two female poets, Sappho and Corinna of Tanagra (the latter may have beaten Pindar in poetry contests) while delicately acknowledging the “rebarbative” (repellent) nature of the classical male perspective, which puts off female readers and translators. Schmidt devotes three chapters to Homer and his legend, examining everything from the bard’s paternity to theories of collaborative composition and the archaeological finds that have borne out the verses’ topographical accuracy. The author has traveled to the places inhabited by these poets and endows their lives with an intimate sense of the physical landscape. Like the transmission of these texts over the ages, each of Schmidt’s chapters comment on its predecessor, and the reader willing to stick with his tireless documentation will be amply rewarded. An exciting work of scholarship by a masterly poet.